Collegians, in particular those at Sejong, Dongguk and Chung-Ang University, are thrilled about young freshmen-age celebrities who are soon to land on their campuses. Nearly 10 K-pop musicians and actors will add their names to university roll books this year alone. Among them are Oh Seung-a of Rainbow, Son Na-eun of Apink, Sandeul of B1A4 and actors, Yeon Jun-suk, Joo Da-young and Choi Ah-ra. studied at the school since 2012, majoring in acting and stage performances. Gyeonggi Province. He entered the school in 2010 to study film and acting. Oh, who turned 26, will study film art at Sejong University in Seoul. Sejong is the second university she will be enrolled at after an initial stint at Sangmyung University where she dropped out in 2008 due to a hectic schedule. "I applied again to deepen my knowledge about film and acting," Oh said after her admission was confirmed in November. Son will be studying drama and film at Dongguk University in Seoul. Dongguk is widely known as the alma mater of many big name artists such as Yoona and Seohyun of Girls' Generation, Jisoo of Tahiti, actors Choi Min-sik, Park Shin-yang, Han Suk-kyu, Yoo Jun-sang, actress Kim Hye-soo, Go Hyun-jung and Lee Mi-yeon. "Although she made her debut and currently works as a singer, she is considering expanding her career into acting in the long run," Son's management agency said. Sandeul, whose real name is Lee Jung-hwan, of K-pop boy band B1A4 will study at Myongji University, majoring in film and musicals. The 21-year-old has experience of featuring in several musicals. "Sandeul has keen interest in musical and other forms of stage performances," the band's management agency said. "He is very happy with his major." Yeon is a newcomer to the prominent performing arts department at Chung-Ang University. 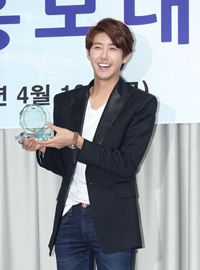 The school, along with Dongguk, is seen as one of the most successful incubators of actors and actresses. 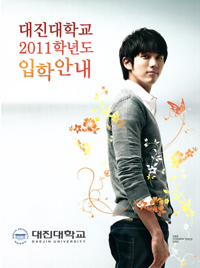 Its notable alma maters include Hyun Bin, Ha Jung-woo, Park Joong-hoon, actresses Ko So-young and Kim Hee-ae. Top actor Kim Soo-hyun, Go Ara, Girls' Generation's Yuri and Sooyoung are currently enrolled there. Entering university is in many ways an important chapter in one's life that is often gladly celebrated. In reality, however, not everyone does so as far as entertainer-turned-freshman is concerned. It is widely rumored that school authorities tend to strike "behind-the-scenes" deals with entertainers in the process of recruiting new students. Critics claim entertainers see their application accepted in exchange for playing publicity and promotional roles for their schools, an increasingly important task in the face of declining student enrollments, a dismal reflection of the country's recent low birth rate. School promotional activities are mostly non-paid work, but sound like sweet deals for celebrities who enter with "preferential" treatment. For that reason, critics are urging education authorities to take closer look at the "special admission system," through which a large number of entertainers have landed on campus despite their relatively low academic achievements at high school. Most top celebrities are enrolled through the system in exchange for fulfilling their part of the "deal." Most universities are calling the rumors baseless, arguing that they are always "fair and transparent" when it comes to student selection. That has still not convinced skeptics who believe that there are many celebrities whose advance to university might have been impossible without "something inappropriate" in the selection prospects. For instance, in 2011 Chung-Ang University came under fire for admitting Luna of K-pop girl group f(X) into its very competitive performing arts department. Back then rumors had it that the 21-year-old made it into the department thanks to a "special favor" from the school. But Chung-Ang denied there was any undercover deal in the admission process. Similarly, in 2010 Sungkyunkwan University was embroiled in a related brouhaha after accepting actress Ko A-sung into its psychology department. The backlash was bigger than other previous cases because she was enrolled in a non-artistic department. The school said Ko was qualified in all aspects to be admitted, but didn't disclose its scoring policy. Professor of education Kim Kyung-hoi at Sungshin Women's University said people should realize that admission officials take various elements into consideration when screening applicants. He explained that it goes beyond high school records to include other indicators such as extracurricular activities. "CSAT score is not everything," Kim said, referring to the state-administered College Scholastic Ability Test. "There are many more indicators with which we can measure each applicant's scholastic ability and potential. Given this, it's inappropriate for people to denounce a school only for having an entertainer enrolled on its student list." Music professor Kim Seung-keun of Seoul National University echoed a similar view, but said domestic colleges are deficient in their ability to communicate with the public leading to the proliferation of rumors. He explained that given the right communication skills, universities should be able to convince the public that their admissions are carried out in a "fair and transparent" manner. "Such a controversy reflects the fact that there are people who don't fully trust the admission system of universities," Kim said. "The primary work to do is restoring people's confidence in the system."